Topic: Slow video on some cam sites. I noticed the new 100GB adsl plan and it looks good. Is the 100GB peek and off peek or is it just 100GB for both(as in basically 50GB peek and off peek)? As it doesnt say anything about peek or off peek. Topic: Times shown for peeks and off peeks. Main site loads decent speed now but members section still takes over a minute just to load. I think you need to take out all the fansy graphics and leave it the way it was with simple layout and graphics and was quick to load. The look of the new site is nice. But.... Its slower than a snail or doesnt even load. Topic: Doprouts when streaming radio or downloading. Doprouts when streaming radio or downloading. ok here is my line status. 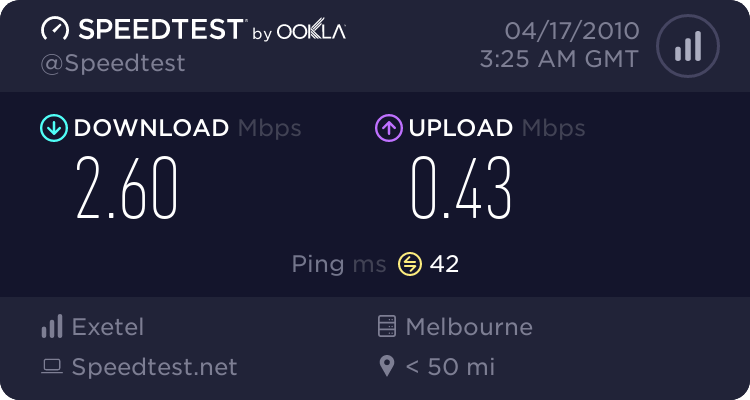 also here is my speed test. Hiya Im having the same problem. I have only just joined Exetel and now most of the stations i listen to in winamp all buffer something shocking. Is there a special thing i have to do to make it not buffer so bad or is it just the way exetel works that makes it buffer like this?